Saturday began with an argument. My children’s ‘whimsical’ approach to getting ready to leave the house, combined with a once-an-hour train schedule left me feeling exhausted and combative. I often find myself saying ‘put your shoes on, put your shoes on, put your shoes on’ like a stuck record (ah, vinyl) and it feels as though the mere idea of wearing shoes to leave the house has never entered their mind before, such is the response I get. Anyway, suffice to say, we caught the train (which helped me out by being delayed) and by the time we’d reached the station, the kids had completely forgotten about our argument and were giddy about the journey. I left them in town with their daddy and returned to an empty house. Once I got home, I immediately started on my never-ending, relentless ‘to-do’ list. I put some laundry on, sorted out a cupboard of kitchen stuff, tidied all the toys away, and was in the middle of unloading the dishwasher when I realised I had an enormous headache. And so, I sat down. And exhaled, for what felt like the first time all day. I stayed sitting in that kitchen chair for twenty minutes, listening to the quiet and taking a breath. Gradually, other noises came back. The birds in the hedge outside. The cars on the motorway in the distance. The tap dripping into the kitchen sink. At that moment, I decided not to do one single thing more from my list. Instead I spent the whole afternoon and evening just taking some time for myself. 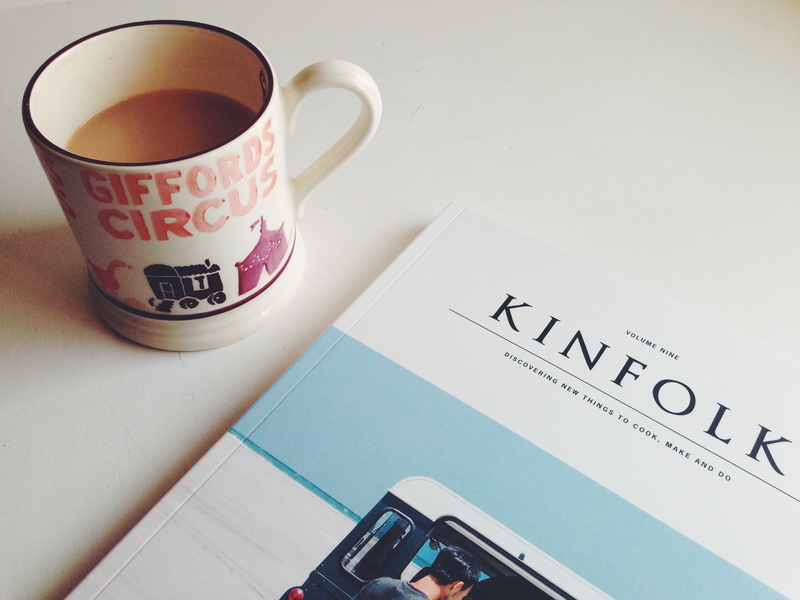 I started with tea and the latest issue of Kinfolk, which is a beautiful, uplifting and inspiring read. Then, I filled the bath with hot water and bubbles and took a cup of tea and a frothy novel (The Misinterpretation of Tara Jupp) into the bathroom for a leisurely soak. There are few things that feel quite as decadent to me as mid-afternoon bathing. After slow, almost languid ablutions and the application of a coat of Chanel ‘Dragon’ red nail polish on my toenails, I then spent a bit of time reading through my RHS study notes, with yet more tea, followed by an easy, uplifting film – Miss Pettigrew Lives for a Day – and noodles. At about 9pm, I took myself off to bed with cheesecake, more tea and yet another book. It was simply a lovely afternoon. As a gardener, I know that the first rule of all gardening is this: Look after your soil. Gardeners, especially those of us who grow fruit and vegetables, know that we cannot keep taking, taking, taking from the soil and expecting the same results. We must put something back. The right nutrients. A bit of TLC. And, in some cases, we can give the earth a fallow year and a bit of a rest. And I do this. I make sure the soil on my allotment is well cared for. I add nutrients, change crops each year, and allow the soil to rest from producing. But, I don’t give myself the same attention. I expect myself to do all the time. To produce, create, deliver, and run about constantly. Without putting anything back into myself. If I want to be healthy and have the energy to run around after my children and not be so exhausted, then I need to eat healthily. I need to get enough rest and sleep. I need to exercise to keep myself in decent health. If I want to be creative, and to write better, then I need to read. If I want to become more accomplished in my chosen subjects, then I need to study and to find the space to learn and take on new ideas. Not just to produce all the time. In fallow periods, I need to slow down and make better use of that breathing space, so that when I do have inspiration, then I know what to do with it. 6 Responses to Time for Myself. Wonderful read – I can identify with every word. Thank you so much – there’s a lot of us exhausted mums out there! It’s the brushing of teeth that’s the trigger point for morning arguments in our house. Kids!!! Haha! Yes, that’s a familiar argument here too!